In any event, everyone we came into contact with at AYB was professional, courteous and helpful and the facility is certainly the best shipyard I have ever encountered, and I wanted to express that to you. In our highly connected world we have grown so accustomed to having immediate access to information that it can be a shock when we leave shore on our boat and find ourselves truly disconnected. While some may revel in the seclusion and escape, others find it stressful. Having internet access can also help to improve your boating experience by allowing you to keep those useful apps updated and keep up to date on current weather patterns. 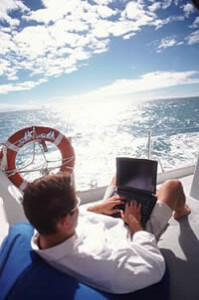 The issue then becomes, how do you get access to the internet from the middle of the ocean or lake? Luckily, technology has our backs. There are multiple devices designed to transfer signals long range and ways to connect via satellites. One option is to get a WiFi range extender. This device helps to boost the signal from your regular WiFi so that it can reach longer distances. If you have a WiFi connection close to where you are boating and aren’t planning on traveling too far offshore this could be a great option. The boosters are fairly inexpensive and work off the service you already use making them an inexpensive choice. Another pick is to use your mobile device. Upgrading to a larger data package will allow you to utilize your smartphone through your cellular data. You can also set your phone up as a hotspot and connect other devices to it. Signal boosters also exist for mobile phones and could be used to help extend the range of your device. Unfortunately, the coverage is still limited and dead spots will most certainly be an issue without cell towers in the middle of The Atlantic. The last choice is to utilize satellite internet. This will give you the best coverage and the most browsing opportunities. The downside is it is also one of the most expensive options. If you plan on long voyages across multiple countries however, this is the most feasible. Satellite is most known for its use in remote areas where landlines aren’t an option so it is well suited for the boating industry. Both the service and the equipment are going to be a large investment but could be worth the costs depending on your needs and the usage you will get out of them. As with all things boat related, it is best to assess your needs and find the right choice for your situation. Being well informed and knowing how you use the internet will be key factors in your decision. How do you stay connected while you’re boating?